Watermelon PvP Texture pack 1.8.9 is a very original and authentic themed PvP texture pack for Minecraft. This pack was created by our friend DustStorm. This pack contains very nicely done textures. Some of the examples of texture include seedlike ores and a very aesthetic custom green sky. This pack replaces your diamond weapons and armor set with pinkish colored ones. Watermelon PvP Texture pack 1.8.9 has a very nice FPS despite it running under 128x resolution. This texture pack mainly replaces the diamond weapons and armor however it does have some additional perks like new textures for your blocks, food, and even your user interface. How to install Watermelon PvP Resource Pack 1.8.9? If you don’t know how to install the Watermelon PvP Resource Pack 1.8.9 just look below, we’ll provide you with a short tutorial there. This installation guide should work with all Minecraft versions. To see the Official Download Links just scroll down. 2. 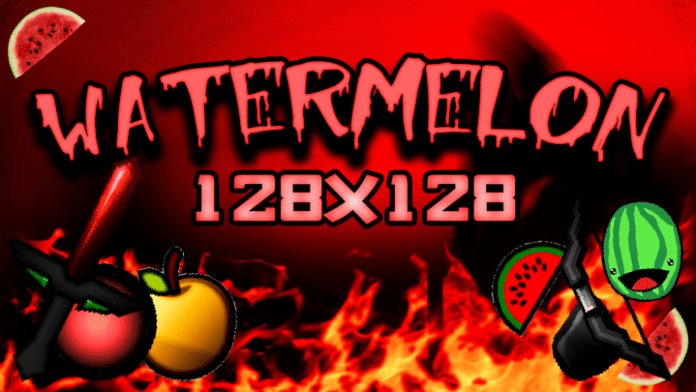 Download the Watermelon PvP Resource Pack 1.8.9 from the official links.